As we age, our skin becomes a biography of where we have been and what we have seen and done. Unfortunately, not all of these experiences are flattering, as seemingly innocent experiences—such as sitting in the sun or an adventurous ski trip—can result in unwanted wrinkles, brown spots, or even scars. Laser skin resurfacing in Charlotte, NC, allows patients to take control of the life story written on their faces, utilizing the most advanced laser technology to inspire the skin to generate new, healthier cells. How Does Laser Skin Resurfacing for Charlotte, NC, Work? Laser skin resurfacing can be accomplished with either nonablative laser treatment or ablative treatments. Nonablative laser treatments keep the top layer of the skin (epidermis) intact and deliver heat in fractional patterns down to the dermis to stimulate collagen, which is essentially the scaffolding of the skin that keeps it from wrinkling. Ablative laser, in contrast, vaporizes the top layer of the skin (epidermis) to stimulate collagen. Fractional laser treatment sessions are generally quick, lasting around 30 minutes to an hour. The length of the procedure depends on how many areas of the face, neck, or chest are being treated. Many patients require a series of laser treatments in order to see the best results. Dr. Raminder Saluja typically recommends one to four laser treatments, depending on which laser is selected, every four to 12 weeks. The exact number of treatments varies based upon the needs of the patient and factors including age and skin type. When Will I See Results from My Laser Skin Resurfacing Treatment? 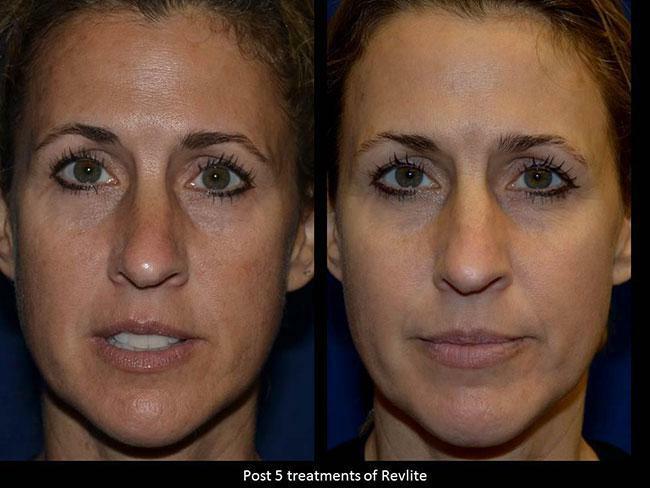 Visible results from fractional resurfacing laser treatments can vary. There are essentially two stages of results: immediate and progressive. Immediately after your first laser treatment your skin will feel smoother and look brighter. Within the first week following your treatment, you will notice a more even and improved skin tone. Over the next six months, as patients continue treatment and the deeper layers of the skin continue responding to treatment, the beneficial results will continue. It is important to recognize that the results of the laser treatment are long lasting, but not permanent. We always recommend that our patients take care of their skin between treatments in order to maximize the results. Protecting your skin against sun damage is one of the best gifts you can give your skin. Some patients appreciate the benefits of an annual touch-up to keep skin looking fresh. Laser skin resurfacing side effects are mild. There may be swelling primarily under the eyes for the first two days post treatment. The skin may feel raw post ablative laser though it should heal itself within a few days. Typically, patients can resume wearing makeup on the second to fourth day of treatment if either erbium or fractional CO2 is selected for treatment. With nonablative lasering, you can return to makeup that very day. There is minimal downtime after a laser skin resurfacing session. Immediately after the procedure, your skin will probably appear red and slightly swollen, but this will fade within two to five days. For milder treatments, many patients are able to cover up the redness the next day and return to work or daily activities. Additionally, many patients experience some skin peeling within the first week after the treatment. Using a moisturizer will help conceal any effects and give your skin time to heal. Is Laser Skin Resurfacing in Charlotte, NC, painful? Many patients compare laser skin resurfacing to the sensation of being snapped with a rubber band. To minimize discomfort, a topical anesthetic is applied prior to the procedure. After the treatment, some patients experience a tingling sensation similar to that of a sunburn, but this normally goes away within a few hours. Patients who are particularly sensitive may wish to discuss this with Dr. Saluja during the consultation. The cost of fractional laser resurfacing varies depending on what laser is used and the size of the area that is being treated. During your consultation, we will provide a personalized treatment plan, including a full estimate of the costs. The $25 cost of the consultation will go toward your fees. We are sensitive to our patient's financial concerns and are happy to help patients develop a treatment plan and schedule that meets their needs. Patients in need of financing options will be happy to know Saluja Laser & Cosmetic Center offers six-month financing options through CareCredit for patients whose procedures cost a minimum of $300.